The MovAlyzeR® and ScriptAlyzeR™ systems are designed to record and analyze with a mouse as an input device. If you use your mouse (default device) as movement recording device, no drivers need to be installed. Press the left mouse key to produce movements. Before you begin recording using the mouse, it is necessary that you calibrate the device to obtain the correct device resolution in cm and sampling frequency in Hz and update these values in the Experiment Settings > Input Device Settings for each experiment using it. Refer to MovAlyzeR® Help > Experiment Settings > Input Device Settings for the procedure. A digitizer records pen movements with extremely high accuracy. Pen movements are more ergonomic than mouse movements. If you have a Wintab-compliant digitizer, you can download and install the manufacturer's Wintab driver. MovAlyzeR® uses the device-independent Wintab tablet driver provided by your digitizer manufacturer. Before you begin recording using a digitizer, it is necessary that you calibrate the device to obtain the correct device resolution in cm and sampling frequency in Hz and update these values in the Experiment Settings > Input Device Settings for each experiment using it. Refer to MovAlyzeR Help > Experiment Settings > Input Device Settings for the procedure. 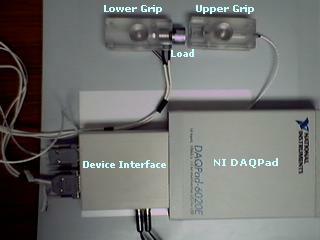 Data Aquisition Systems like NI DAQPad, connected to a force application system through a device interface, can be used to record force data using the GripAlyzeR™. For Example, the Gripper device from Neuroscript (consisting of an upper grip unit, lower grip unit and a load unit) can be used as an input device by connecting it through a device interface and NI DAQPad data acquisition device. Before you begin recording using the gripper with GripAlyzeR™, it is necessary that you update the resolution in cm and sampling frequency in Hz in the Experiment Settings > Input Device Settings for each experiment using it. For the gripper device from NeuroScript, the typical sampling frequency is 256 Hz and the resolution is 1 N.
Also, additional Input Device Settings need to be updated at Settings > Select Input Device > DAQPad Settings before conducting an experiment. For more details on the gripper device, refer to MovAlyzeR® Help > GripAlyzeR™ > Introduction to GripAlyzeR™. Bimanual grip-force coordination can be quantified using a device measuring the grip forces in left and right hands and the simultaneous pulling force to separate the upper and lower force transducers. The task compares to holding a marker pen in one hand and pulling the cap off with the other hand. The grip and pulling forces show a highly proportional increase while increasing the pulling force. 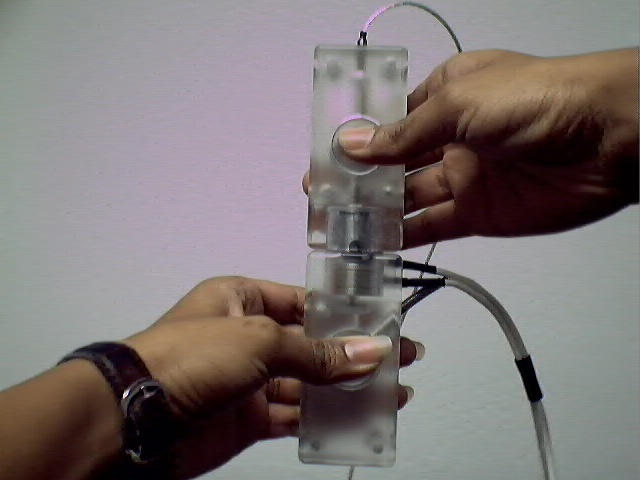 The first prototype is by Alberts et al., 1998. (Click Here for the abstract). The gripper hardware (consisting of an upper grip unit, lower grip unit and a load unit) can be used as an input device by connecting it through a device interface and National Instruments DAQPad data acquisition device. The gripper device is to be used in conjunction with NeuroScript's GripAlyzeR™. The software communicates with the gripper device through the NI DAQPad and the device interface to acquire force sensor data. GripAlyzeR can be used to conduct and record trials in an experiment, analyze, quantify and plot the results. A typical gripper task consists of pulling the upper and lower grip units apart (a magnet holds them together). 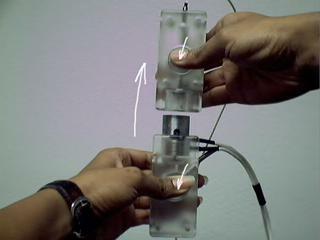 While pulling the units apart, apply pressure on the upper and lower grip sensors using the left and right hand thumbs, as shown in the above diagrams. The gripper consists of two units with each possessing a force sensor for the thumb. The upper and lower units are held together with a magnet of a programmable force. For more information on the gripper device and testing and installation, refer to the GripAlyzeR™ online help. To purchasethe gripper device from NeuroScript, please contact us.